There's plenty of hot air in the Geelong Council meeting this week when one item was voted five for, five against, then the mayor cast a vote. It's all about that budget of $2 million for Christmas decorations - six months away from now, particularly that bling Christmas tree meant to float on the water and bring zillions of dollars to Geelong in tourism. I don't think so! So far there's no data and as one councillor reckons, it's 'secret men's business'. 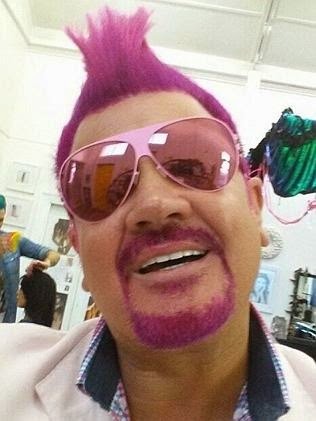 Geelong mayor Darryn Lyons with bright pink dye in his hair and beard. THE Geelong council is at war over the Mayor’s Christmas plan for Geelong and the need for transparency. Divisions surfaced at the council meeting last night, with accusations of secrecy, bullying, hijacking and “bonehead” strategies exchanged across the table. At one point Cr Andy Russell quipped the budget had been put together on the back of a napkin. Cr Michelle Heagney, who is responsible for the Central Geelong and planning portfolios, expressed frustration about an apparent lack of transparency in the council chamber, adding she found it “very concerning”. The war erupted after Cr Jan Farrell sought to have a matter which had been placed in camera, moved into open council so it could be discussed in front of the gallery and media. That item is understood to relate to the mayor’s vision for Christmas in Geelong, which includes expansive street lighting and an iconic, floating Christmas tree. Cr Farrell moved that the item — listed at number 16 on the agenda — be discussed openly as no preferred supplier had been identified and the matter had been broadly discussed in public arenas previously. Cr Farrell did not reveal what the confidential item was but said she was concerned the scope of the project was being extended and that shouldn’t happen in secret. She called the process “secret men’s business’’. Etc etc. Geelong council will spend $2 million on Christmas decorations and lighting after mayor Darryn Lyons overruled a vote for the funding details to be made public. The decision to spend up to $500,000 on a Christmas tree and $1.5 million on a lighting display comes just weeks before hundreds of local Alcoa workers lose their jobs. Alcoa's Geelong smelter will shut in August, with 500 jobs going. Alcoa’s rolling mills, which employ another 500, will also shut by the end of the year. On Tuesday night councillors engaged in a fiery debate over the $2 million Christmas project for the coming festive season. Cr Jan Farrell, who represents the Beangala Ward in Geelong, sought to defer the $2 million allocated to the Christmas tree and lighting until the project was investigated by an independent external auditor. Citing concerns - shared by five other councillors - over initial and recurring costs of the project, Cr Farrell said she disapproved of spending $2 million on Christmas decorations at a time when many Geelong families would be feeling the pinch. 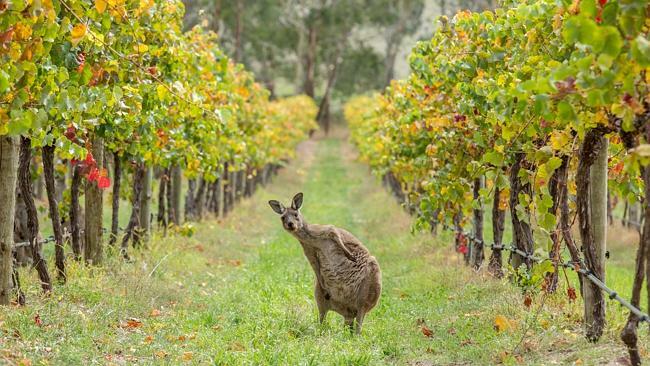 ‘‘I have talked to the good people of Bellarine, and they are not supportive of spending $2 million in the [Geelong] CBD on a tree and lights,’’ she said. 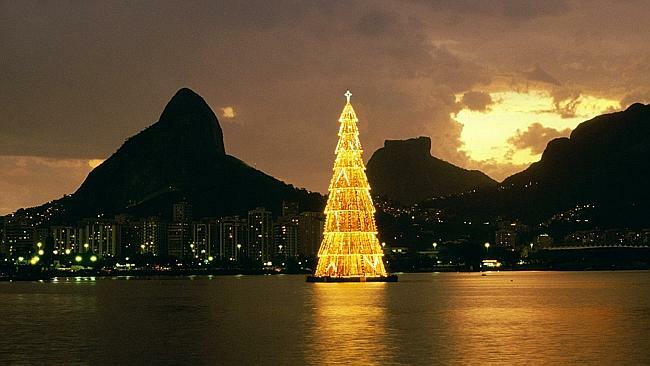 Cr Farrell said the initial proposal for the project stated that the tree would remain up all year and not just for the amended time of six weeks. It is understood that when Cr Farrell also moved a motion to publicly release a report regarding spending on the Christmas tree, mayor Lyons used his casting vote to keep the report confidential. Cr Richards said he had not supported the Christmas tree idea when it was first proposed to the chamber, because it was “too much money for too little result, has no business plan and no report to tell ratepayers what you get for the money”. “The key issue in Geelong right now is jobs and employment,” he said. Fairfax Media tried to contact mayor Lyons several times on Wednesday, but he did not return the calls. We drive occasionally around the Bellarine Peninsular exploring roads we've never travelled before but we hadn't found this one. Campbell Point House as private property on Lake Connewarre isn't for the likes of us! Once upon a time it was the place where Aboriginal tribes gathered. Wow - how the other half can live - though now this fine 'French' chateau - is not a family home but a reception centre. Recently those cooks on TV used the location for a shoot. I noticed one sentence in the article. "It's gated and very private'. Hmmm. Not that I'm jealous of such a house but it does seem excessive in this day and age. Tell this to the renters in Corio and Whittington eh! MASTERCHEF is a “well-oiled machine” according to Aaron Parkhill, who opened the doors of his multi-million dollar property in Leopold for Thursday’s episode of the program. And as viewers of MasterChef will notice, Campbell Point House is no ordinary home.“You would be hard-pressed to find a more beautiful location anywhere in the world,” Mr Parkhill said.He estimates he has spent more than $10 million on Campbell Point House, a 150sqm French-styled chateau he designed himself and had built on 16 hectares “It’s at least that, but I really have no idea,” he said. “If I had more (money) I’d spend it.”Mr Parkhill is the nephew of Frank Lowy, of Westfield fame, a man who was last year nominated Australia’s second richest man (BRW Rich 200).He said he was happy to oblige when one of the MasterChef producers came asking for use of the property to film in March. Campbell Point House belies its youth; only six years old, it looks established and settled, as though it has been there on the edge of Lake Connewarre for much longer. .It’s gated and very private. National Geographic has always produced stunning photos and at present there's a competition out there for ordinary people to send in their photos I do like this one 'Here's to looking at you kid' or whatever you like to call it. And check out some of the other photos with the link below. I read this in today's Geelong Advertiser but I do get updates from National Geographic as email. Saw this article in the midnight ABC news. Sounds like a great idea. Getting other people in on the drawing is excellent and must certainly be an ice-breaker. 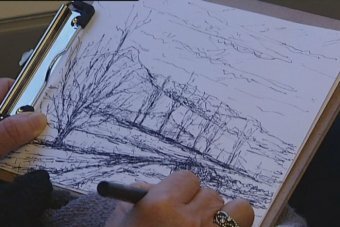 An artist's regular train commutes in England and Victoria inspired a new exhibition set to roll into the Bendigo Station. 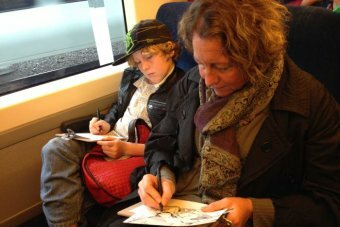 Transit, by Julie Andrews, is comprised of black-and-white sketches by passengers on V/Line trains. "In England I did a lot of travel on trains, and I found there's a space with that that I find really useful for creativity," the Bendigo-based artist said. "When I started studying in Melbourne I'd be taking the train and drawing, and people would be watching and we'd always end up having conversations - really meaningful conversations." It's quite relaxing actually. It made the trip go quickly. For the past two months, Mrs Andrews has been asking complete strangers to sketch for her. People of all ages and abilities are encouraged to pick up a pen and clipboard and have a go. Sarah Archard and her children took up the challenge and found it a great way to ride from Bendigo to Melbourne. "It's quite relaxing actually. It made the trip go quickly," Ms Archard said. "It's excellent. It's not something you'd normally do because spare time is lacking in everyone's lives at the moment." Commuter Marie Belfield said the sketches offered a deeply personal insight to the artist. "It's like looking inside of people and seeing a different life," Ms Belfield told the ABC. "You see a sort of secret life of people when you're looking at their drawings you get an insight into a person's secret life through their drawings. "You can't really tell what people are like when you talk to them. 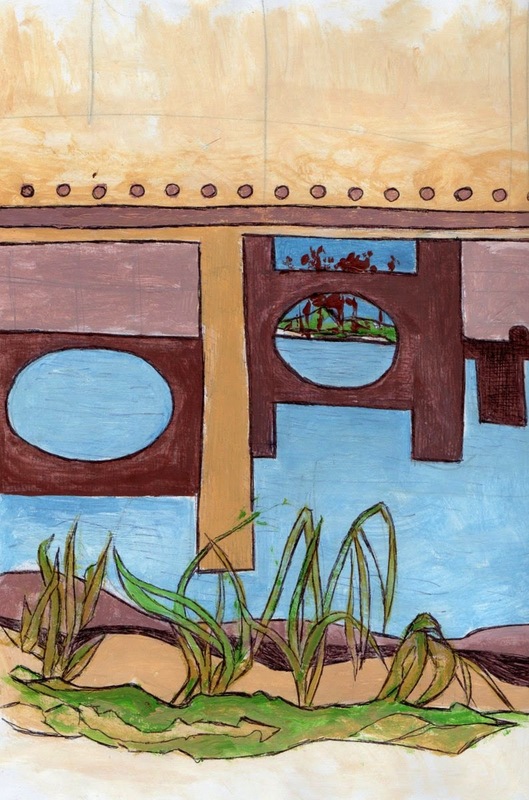 You don't really know what's going on inside but the drawing will reveal another layer of them." "Someone said to me on a train: 'It's a funny space where we are alone together'." Mrs Andrew has been running the program about two days a week on a variety of off-peak V/Line trains. She said she can have up to 30 passengers drawing on any day. Sketch contributors will be rewarded at the end of the exhibition by being able to keep a work of their choice. "At the closing we look around and we choose a drawing that resonates with us as an anonymous gift from one traveller to another. It's a way of connecting," Mrs Andrews said. 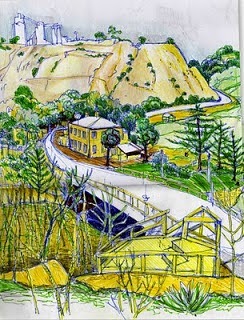 Transit will open at Bendigo Station on Monday, following a recent exhibition of sketches in Melbourne. The Transit project will continue until October. 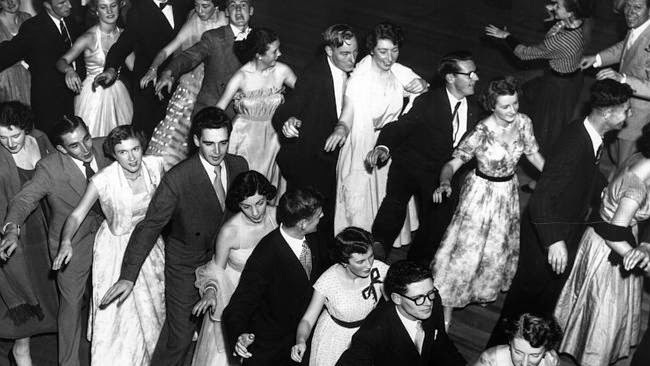 The 1950s - were they the good old days? The Herald Sun has run an interesting set of photos from the 1950s. Some people call that time 'the good old days' but I don't think it was for women - all that work in the kitchen and laundry. Though for children it perhaps was an idyllic time. 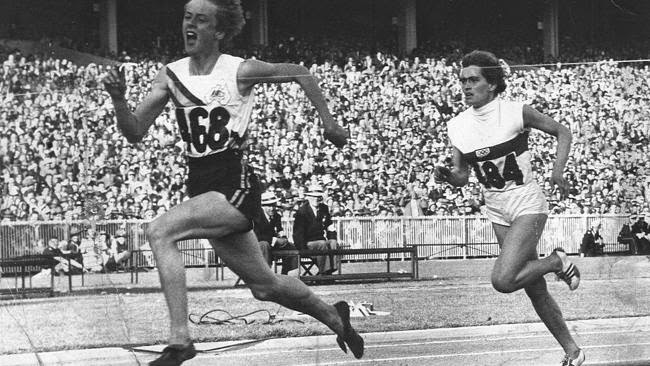 Biggest names in sport: Dawn Fraser, Betty Cuthbert, Peter Thomson. 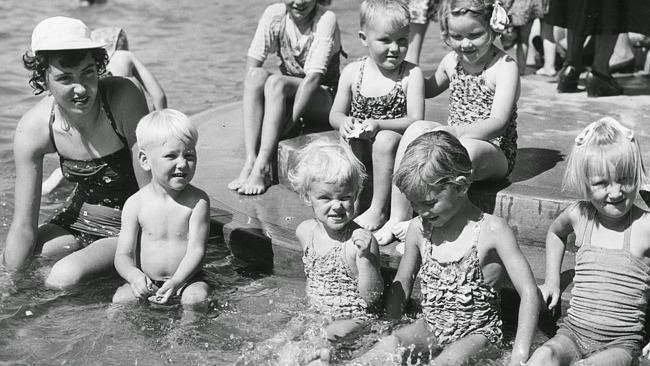 Here are some of the photos in the Herald Sun from the 1950s. 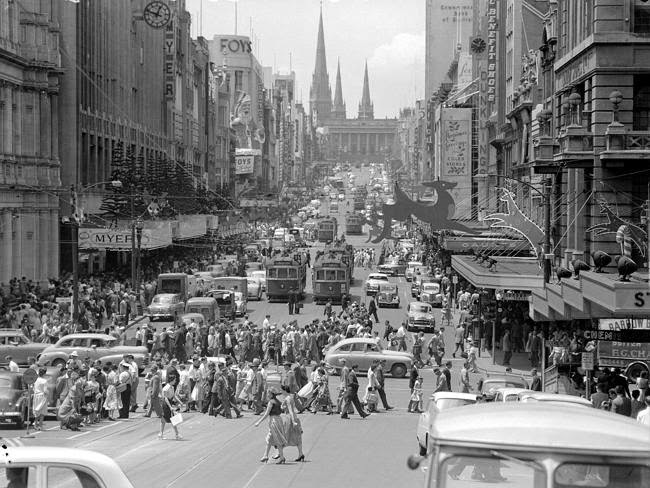 I was in Melbourne in the late 50s, the time of the Olympic Games and the first TVs in Melbourne. Okay, we live very close to the saltworks and some people say it's an eyesore. I don't worry too much about it - the old Cheetham Salt works. Now someone has a plan to turn it into another kind of suburb, but what about sea -levels? All houses would have to be on stilts surely! Dream on! 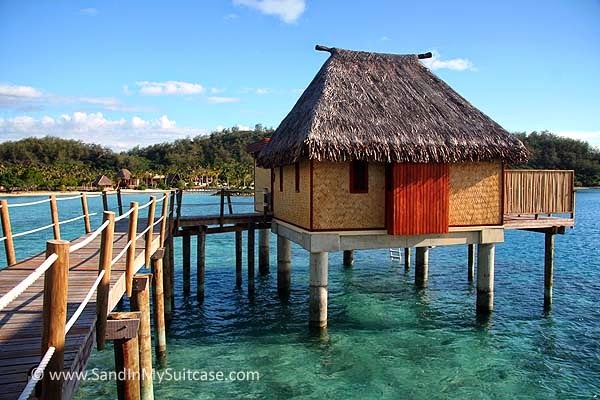 Maybe they could build resort style Fijian bures over water! A MASSIVE $4 billion development proposal is set to transform Moolap’s former Cheetham Saltworks into a modern waterfront suburb. The ‘’game-changing’’ project has the potential to support more than 1200 full-time jobs annually for the next 25 years, according to the proponents. Landowner Ridley Corporation has announced a partnership with Sanctuary Living for the development of the 465ha property.They propose to create 155ha of mixed-density residential land, 80ha of employment land, a 75ha conservation reserve and leave 20ha of open foreshore.That would link with Geelong’s Botanic Gardens and Eastern Beach, enabling the city’s publicly accessible coastline to extend much further east. Sanctuary Living is the developer behind the Geelong Golf Club estate in North Geelong. Ridley’s CEO Tim Hart said the two companies were planning a world-class, environmentally responsible, mixed-use land project. City of Greater Geelong planning manager Peter Bettess said the State Government was in talks with Ridley and no rezoning or planning permit application had yet been lodged. 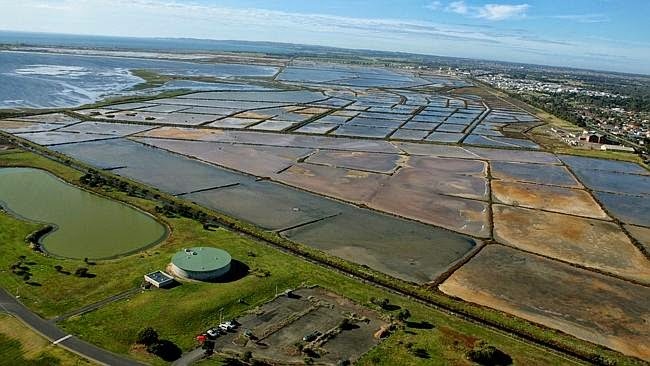 Geelong Field Naturalists Club spokesman Bruce Lindsay said the Moolap wetlands remained an important habitat for shorebirds“There’s still a long way for the project to go in terms of environmental considerations,” he said. 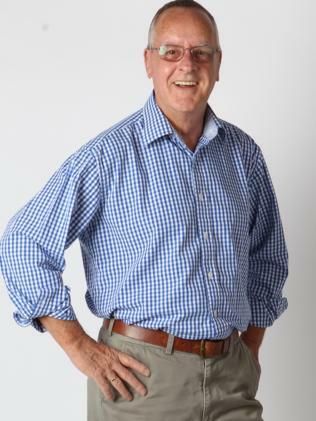 “We feel the infill on the entire site obviously remains the proponent’s intent and this is a poor outcome for Geelong and has international ramifications.”Dr Lindsay said large-scale residential and industrial development was unnecessary.“When you weigh up the outcomes, there are plenty of other development sites elsewhere in Geelong,” he said. The former Saltworks site borders the bay on the Geelong-Portarlington Rd, between CSIRO’s Animal Health Laboratory facility and Point Henry.. When the small elderly congregation of South Geelong were devastated that the Uniting Church head office in Melbourne sold the Geelong property a few months ago - which included a church, hall, and welfare offices, they had to move somewhere. Toyota bought the property for over $4 million! The congregation chose to join our East congregation and brought with them their tears and some of their chattels that weren't bolted down. One item was a beautiful lantern with symbols on the faces made by a stained glass worker. It now hangs in the chapel near the data projector - a nice reminder that we need the old and the new. The other picture is of a banner for Pentecost (which was celebrated yesterday) made by one of our East ladies. We are fortunate to have a nice modern looking chapel and not a heritage building with furniture difficult to move about. The Weekly Review comes out with Saturday's Geelong Advertiser and often has some good reading before you get to the property pages. 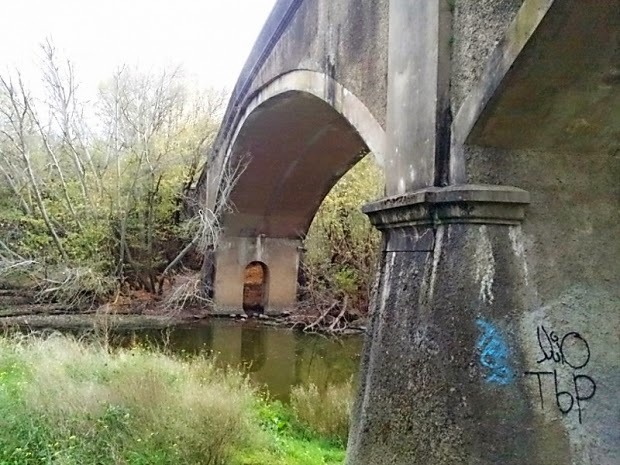 An article caught my attention - about Fyansford which is an area just out of Geelong and is mainly a meandering river and two bridges and of course the remains of the cement factory. 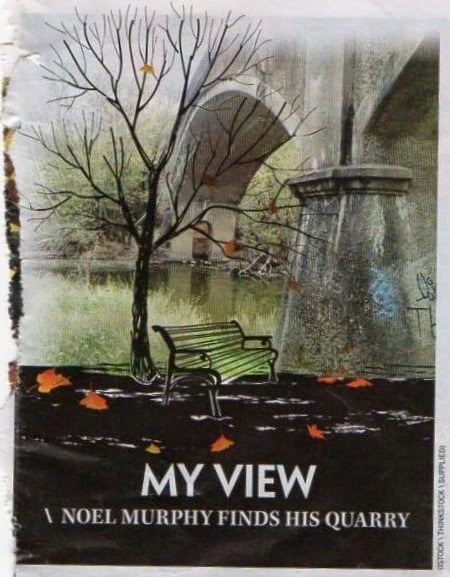 Noel Murphy's article is well written and he provides lots of information. I've sketched there a few times, particularly of one of the bridges. I like his picture also - a bit photo-shopped no doubt. 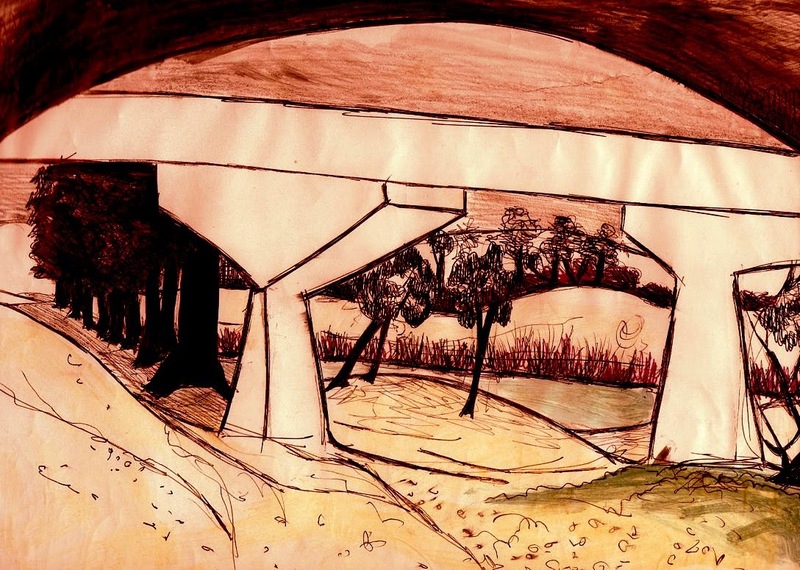 Autumn’s burnished reds and yellows lie as prettily littered leaves atop the grey, stained concrete piers and triple arches of John Monash’s bridge at Fyansford. For 114 years, the bridge has spanned the Moorabool River where it emerges from the old cement quarry, a serviceable chunk of infrastructure for the valuable and historic trade routes and social links to Geelong’s west. Superseded more recently, it is a mute witness to dramatic changes unfolding in the area – an area named for colonial Australia’s ferocious “Flogger” Foster Fyans, the Norfolk Island commandant who became Geelong’s first police magistrate. The pub across the road is changing, expanding, bringing dozens of pokies into an old colonial pub being prepped for the anticipated influx of 1000 houses and thousands more new arrivals when the Fyansford Green estate gets going. It’s been a long time coming. It’s even longer since the old quarry was shut and sold, leaving a monumental clean-up job that has more or less stymied developers to date. There’s a fair chance they’ll find more than a few fossils and scientific specimens along the way, like the quarry turned up for the past century and more; ancient whales’ teeth, shark teeth and the like. Gone are the quarry’s giant chimneys, blasted to the ground – although one needed a nudge from an excavator in a remarkable stunt witnessed by hundreds of spectators. Gone are the trucks and carts, pits and pumps, the kilns and pyrators, high-rise conveyors and offices that made up one of Geelong’s major employers for more than a century from 1890. Gone also is a kilometre-plus stretch of the Moorabool that the quarry operator re-routed in the 1990s, to the fury of environmentalists. Gone are the Puffing Billy-like steam-engine trains that Herne Hill 14-year-old Russell Rushton was allowed to drive after school, prompting jealous classmate/neighbour Philip Batty, also 14, to kill him – stabbing him more than 20 times – in 1966. A massive manhunt failed to find Rushton. Six weeks later, three Morongo Girls’ College schoolgirls stumbled over his body on a cross-country exercise. Batty was sentenced to 10 years; he died last year. Gone are the riggers who patched and painted the 120-metre-high chimneys and nearby cement silo precinct that alone survives, above Hyland Street, with its surrounding tunnels and concrete chambers designed as an escape route in case of explosions. The bridge was one of the first reinforced concrete bridges built in Australia. It used a system developed by French horticulturalist Joseph Monier, who started by using wire mesh in his gardening pots. The technique was marketed by a German, Gustav Adolf Wayss, and used in the dugouts and bunkered pillboxes of his confrères in World War I from 1914-18. Sir John Monash, with his engineer’s knowledge of the fortifications and their strengths and weaknesses, and perhaps the best tactical nous of any general in the conflict, changed the nature of the Allies’ warfare and fortunes, and blasted the Germans’ concrete battlements to smithereens. Monash and the tough Australians under his command are widely considered a force that hastened an end to the monumental horror of WWI. It’s not exactly what you’d expect to find in an old pont that’s played second fiddle to another bridge since 1970. I guess the spray-can vandals who daub their handiwork around its base don’t know any of this. It’s a pity … it kind of takes the shine off more than just autumn. The writer, Peter Moore, has some great ideas for rejuvenisation of Geelong by spending $500,000 on arts projects instead of a silly bling Christmas tree. Good idea Peter. LET’S forget the polarisation both sought after and encouraged by Mayor Darryn Lyons. And let’s forget the mind-numbing council trivialisation that has dominated the pages of the Advertiser over the past week or so. The new “official’’ crest (which, for some reason, isn’t official) and the planned redesign of the mayoral chain would on their own qualify for two of my 2014 annual awards — the Most Irrelevant Council Initiative and the Who Cares? Not Me Or Anyone Else Council Proposal. We have also in the past week raised the bar at the “artist’s impression’’ level to accommodate the newer digital imaging with the hanging baskets of the CBD. These are all diversions from the main task at hand which, as most people seem to agree, is the revitalisation of the sad and sorry CBD. Mayoral chains, new council crests, hanging baskets and unaffordable and unwanted Christmas trees do not a CBD make. What does is activity, people and an environment that encourages the wider community to want to visit the city centre. As has oft been stated, if you look at any similar city throughout the world that has transitioned from manufacturing to some other status, most have based their rejuvenation through culture and the arts. Geelong has a proud and lively arts scene and has dipped its toe into this well-worn path of progress before in recent times. Do you remember the Shoot Out Film Festival that the council promoted and ran for a couple of years in 2000 or so? 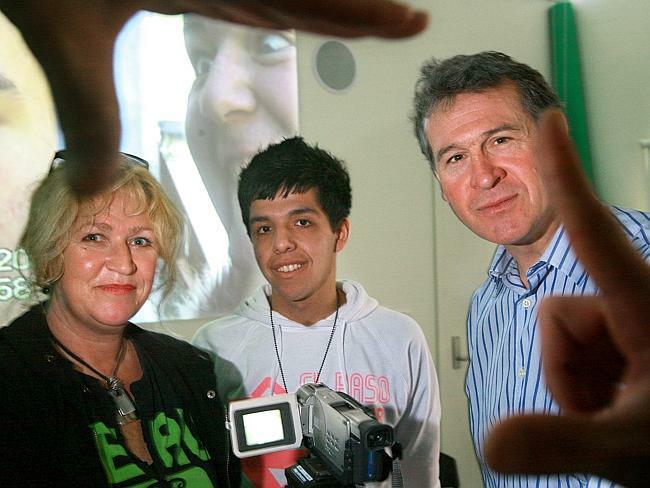 A great concept as 20 or more teams from around Australia competed overnight to produce a movie based in Geelong. Only “in camera” editing was allowed and the finalists showed their wares to a packed house and panel of judges at Costa Hall the following day. As often happens, enthusiasm and impetus for this faded, money to promote it became an issue and a potential annual festival with all the inherent benefits of interest, tourism, national — and down the track international — awareness were lost in a sea of indecision and apathy. Why can’t we resurrect this concept of the Shoot Out film festival? This time, why not put up a prize of $100,000 for the winner? I could see not only Australian but international interest with prizemoney of this size. And why stop there? How about another $100,000 prize for the Greatest Poetry Shoot Out in the World, $100,000 for the Best Short Story in the World, $100,000 for the Best 12-hour Portrait of a Living Person and $100,000 for the Best Human Condition Photograph taken in a 24-hour period? Just by happenstance, I’ve allocated $500,000 of the council’s annual budget to these arts projects. Also by happenstance, the $500,000 I’ve allocated matches the money council wants to spend on a Christmas tree. Two points here: the Christmas tree the Mayor wants to build quite simply can’t be built for that price; and which concept is likely to attract year-round interest and visitors to Geelong? I’ve thought about it and in a completely unbiased and unselfish assessment of the potential of five huge annual cultural activities, attracting worldwide interest against an unbuildable Christmas, my festivals win, win, win!